Aung Lynn, Myanmar's ambassador to the United States, says his nation's security forces didn't overreact in responding to attacks by Rohingya militants on August 25. Since then, nearly 390,000 Rohingya Muslims have fled to Bangladesh, as their villages have been burned and looted. Myanmar is the victim of terrorists and "false media" reporting on the Rohingya crisis in Rakhine state, the country's ambassador to the United States told VOA. Aung Lynn said the country's security forces didn't overreact in responding to attacks on security forces by Rohingya militants on August 25. Since then, nearly 390,000 Rohingya Muslims have fled to Bangladesh, as their villages have been burned and looted. The United Nations calls the exodus "ethnic cleansing," and aid workers report destitute people overloading the resources at refugee camps. On Thursday, the U.N. said 40 percent of the Rohingya in Rakhine had fled their homes, and U.S. Secretary of State Rex Tillerson said the violence against them must stop. "How can you say that [the response] is out of proportion? There may be many terrorists who were involved" in the attacks last month, Aung Lynn said. He declined to give Sarah Zaman from VOA's Urdu service an estimate of the number of members of the Arakhan Rohingya Salvation Army, which claimed responsibility for the August 25 attacks. "I don't want to argue with the numbers, but if people are innocent, innocent villagers, they have no reason to flee away from their villages," he said. 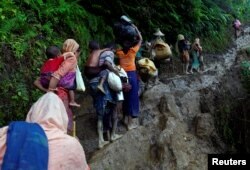 Myanmar security forces are protecting many Rohingya; they just have to ask for help, he said. FILE - A house is seen on fire in Gawduthar village, Maungdaw township, in the north of Rakhine state, Myanmar, Sept. 7, 2017. However, many refugees and international journalists have reported security forces led the way in burning scores of villages to the ground. The ambassador repeatedly said that international news media weren't reporting the full story and said aid agencies needed to work with Myanmar to give an accurate picture. 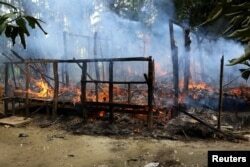 He said there had been scant coverage of the number of Buddhist and Hindu residents of Rakhine who fled. "We do not want to argue with the false media," Aung Lynn said. He went on to indicate that propaganda from the Rohingya community was responsible for growing international concern about the crisis. "We have a very limited resources. We cannot compare ourselves with the resources that the other side has in this situation," the ambassador said. When VOA asked whether he meant that the Rohingya had more resources than his government, he said, "You can make your own judgment." FILE - Rohingya refugees climb up a hill after crossing the Bangladesh-Myanmar border in Cox's Bazar, Bangladesh, Sept. 8, 2017. Aung Lynn said Myanmar was prepared to take back any "genuine villagers" who wanted to return, if they "can prove that they want to live peacefully and in harmony with all other communities." However, they would need to prove they met citizenship requirements. That could be difficult because Myanmar has denied the Rohingya citizenship since 1982, although many families have been in the country for generations. He laid responsibility for the citizenship issue on the Rohingya, saying the government allows them to apply for citizenship, but that they are not cooperating with authorities. "They want to be known as Rohingyas, and since we don't have the nomenclature of Rohingya in the citizenship process, that is the reason things are not going ahead," the ambassador said. The Buddhist Bamar ethnic group dominates the population, but the government recognizes more than 100 minority communities. However, Rohingya are not recognized; the government generally considers them to be economic migrants from Bangladesh, and many people in the country call them Bengalis. Aung Lynn said those applying for citizenship could omit ethnicity information on their forms. "If they really want to become citizens of Myanmar, if they meet the requirements, they will be in the process to consider to become citizens of Myanmar," he said. The ambassador said his government had been trying to resolve the Rohingya situation for years. It intends to implement a U.N.-backed plan issued last month by a commission that former U.N. Secretary-General Kofi Annan led. FILE - Myanmar's State Counsellor Aung San Suu Kyi delivers an opening speech during the Forum on Myanmar Democratic Transition at Myanmar International Convention Center in Naypyitaw, Myanmar, Aug 11, 2017. Myanmar's de facto leader, Aung San Suu Kyi, has canceled plans to attend the U.N. General Assembly next week in New York. 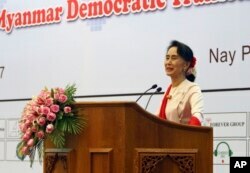 Aung Lynn said by staying home, Suu Kyi was making it clear that Myanmar was committed to resolving the situation. He said the Nobel Peace Prize laureate would meet with U.N. officials and others next week in Myanmar to work toward that goal. But, he said, the people of Myanmar feel they are victims of the crisis. "Of course we are. Because we are the people with the very limited resources, and we have been living with different people for hundreds of years," without religious violence, Aung Lynn said. However, since the end of British colonial rule in 1947, Myanmar has fought several wars against other ethnic groups, including the Karen, the Kachin and the Shan.